"The Fed" redirects here. For the Welsh trade union, see South Wales Miners' Federation. For other uses, see The Fed (disambiguation). Eccles Building, Washington, D.C., U.S.
Interest paid on excess reserves? The Federal Reserve System (also known as the Federal Reserve or simply the Fed) is the central banking system of the United States of America. It was created on December 23, 1913, with the enactment of the Federal Reserve Act, after a series of financial panics (particularly the panic of 1907) led to the desire for central control of the monetary system in order to alleviate financial crises. [list 1] Over the years, events such as the Great Depression in the 1930s and the Great Recession during the 2000s have led to the expansion of the roles and responsibilities of the Federal Reserve System. The U.S. Congress established three key objectives for monetary policy in the Federal Reserve Act: maximizing employment, stabilizing prices, and moderating long-term interest rates. The first two objectives are sometimes referred to as the Federal Reserve's dual mandate. Its duties have expanded over the years, and currently also include supervising and regulating banks, maintaining the stability of the financial system, and providing financial services to depository institutions, the U.S. government, and foreign official institutions. The Fed conducts research into the economy and provides numerous publications, such as the Beige Book and the FRED database. The Federal Reserve System is composed of several layers. It is governed by the presidentially appointed board of governors or Federal Reserve Board (FRB). Twelve regional Federal Reserve Banks, located in cities throughout the nation, regulate and oversee privately owned commercial banks. Nationally chartered commercial banks are required to hold stock in, and can elect some of the board members of, the Federal Reserve Bank of their region. The Federal Open Market Committee (FOMC) sets monetary policy. It consists of all seven members of the board of governors and the twelve regional Federal Reserve Bank presidents, though only five bank presidents vote at a time (the president of the New York Fed and four others who rotate through one-year voting terms). There are also various advisory councils. Thus, the Federal Reserve System has both public and private components. [list 2] It has a structure unique among central banks, and is also unusual in that the United States Department of the Treasury, an entity outside of the central bank, prints the currency used. The federal government sets the salaries of the board's seven governors. The federal government receives all the system's annual profits, after a statutory dividend of 6% on member banks' capital investment is paid, and an account surplus is maintained. In 2015, the Federal Reserve earned net income of $100.2 billion and transferred $97.7 billion to the U.S. Treasury. Although an instrument of the US Government, the Federal Reserve System considers itself "an independent central bank because its monetary policy decisions do not have to be approved by the President or anyone else in the executive or legislative branches of government, it does not receive funding appropriated by the Congress, and the terms of the members of the board of governors span multiple presidential and congressional terms." The primary motivation for creating the Federal Reserve System was to address banking panics. Other purposes are stated in the Federal Reserve Act, such as "to furnish an elastic currency, to afford means of rediscounting commercial paper, to establish a more effective supervision of banking in the United States, and for other purposes". Before the founding of the Federal Reserve System, the United States underwent several financial crises. A particularly severe crisis in 1907 led Congress to enact the Federal Reserve Act in 1913. Today the Federal Reserve System has responsibilities in addition to ensuring the stability of the financial system. Banking institutions in the United States are required to hold reserves‍—‌amounts of currency and deposits in other banks‍—‌equal to only a fraction of the amount of the bank's deposit liabilities owed to customers. This practice is called fractional-reserve banking. As a result, banks usually invest the majority of the funds received from depositors. On rare occasions, too many of the bank's customers will withdraw their savings and the bank will need help from another institution to continue operating; this is called a bank run. Bank runs can lead to a multitude of social and economic problems. The Federal Reserve System was designed as an attempt to prevent or minimize the occurrence of bank runs, and possibly act as a lender of last resort when a bank run does occur. Many economists, following Nobel laureate Milton Friedman, believe that the Federal Reserve inappropriately refused to lend money to small banks during the bank runs of 1929; Friedman argued that this contributed to the Great Depression. In the United States, the Federal Reserve serves as the lender of last resort to those institutions that cannot obtain credit elsewhere and the collapse of which would have serious implications for the economy. It took over this role from the private sector "clearing houses" which operated during the Free Banking Era; whether public or private, the availability of liquidity was intended to prevent bank runs. Through its discount window and credit operations, Reserve Banks provide liquidity to banks to meet short-term needs stemming from seasonal fluctuations in deposits or unexpected withdrawals. Longer term liquidity may also be provided in exceptional circumstances. The rate the Fed charges banks for these loans is called the discount rate (officially the primary credit rate). By making these loans, the Fed serves as a buffer against unexpected day-to-day fluctuations in reserve demand and supply. This contributes to the effective functioning of the banking system, alleviates pressure in the reserves market and reduces the extent of unexpected movements in the interest rates. For example, on September 16, 2008, the Federal Reserve Board authorized an $85 billion loan to stave off the bankruptcy of international insurance giant American International Group (AIG). In its role as the central bank of the United States, the Fed serves as a banker's bank and as the government's bank. As the banker's bank, it helps to assure the safety and efficiency of the payments system. As the government's bank or fiscal agent, the Fed processes a variety of financial transactions involving trillions of dollars. Just as an individual might keep an account at a bank, the U.S. Treasury keeps a checking account with the Federal Reserve, through which incoming federal tax deposits and outgoing government payments are handled. As part of this service relationship, the Fed sells and redeems U.S. government securities such as savings bonds and Treasury bills, notes and bonds. It also issues the nation's coin and paper currency. The U.S. Treasury, through its Bureau of the Mint and Bureau of Engraving and Printing, actually produces the nation's cash supply and, in effect, sells the paper currency to the Federal Reserve Banks at manufacturing cost, and the coins at face value. The Federal Reserve Banks then distribute it to other financial institutions in various ways. During the Fiscal Year 2013, the Bureau of Engraving and Printing delivered 6.6 billion notes at an average cost of 5.0 cents per note. Federal funds are the reserve balances (also called Federal Reserve Deposits) that private banks keep at their local Federal Reserve Bank. These balances are the namesake reserves of the Federal Reserve System. The purpose of keeping funds at a Federal Reserve Bank is to have a mechanism for private banks to lend funds to one another. This market for funds plays an important role in the Federal Reserve System as it is what inspired the name of the system and it is what is used as the basis for monetary policy. Monetary policy is put into effect partly by influencing how much interest the private banks charge each other for the lending of these funds. Federal reserve accounts contain federal reserve credit, which can be converted into federal reserve notes. Private banks maintain their bank reserves in federal reserve accounts. The balance between private interests and government can also be seen in the structure of the system. Private banks elect members of the board of directors at their regional Federal Reserve Bank while the members of the board of governors are selected by the President of the United States and confirmed by the Senate. Ben Bernanke (lower-right), former chairman of the Federal Reserve Board of Governors, at a House Financial Services Committee hearing on February 10, 2009. Members of the board frequently testify before congressional committees such as this one. The Senate equivalent of the House Financial Services Committee is the Senate Committee on Banking, Housing, and Urban Affairs. The Federal Banking Agency Audit Act, enacted in 1978 as Public Law 95-320 and 31 U.S.C. section 714 establish that the board of governors of the Federal Reserve System and the Federal Reserve banks may be audited by the Government Accountability Office (GAO). The Board also plays a major role in the supervision and regulation of the U.S. banking system. It has supervisory responsibilities for state-chartered banks that are members of the Federal Reserve System, bank holding companies (companies that control banks), the foreign activities of member banks, the U.S. activities of foreign banks, and Edge Act and "agreement corporations" (limited-purpose institutions that engage in a foreign banking business). The Board and, under delegated authority, the Federal Reserve Banks, supervise approximately 900 state member banks and 5,000 bank holding companies. Other federal agencies also serve as the primary federal supervisors of commercial banks; the Office of the Comptroller of the Currency supervises national banks, and the Federal Deposit Insurance Corporation supervises state banks that are not members of the Federal Reserve System. Some regulations issued by the Board apply to the entire banking industry, whereas others apply only to member banks, that is, state banks that have chosen to join the Federal Reserve System and national banks, which by law must be members of the System. The Board also issues regulations to carry out major federal laws governing consumer credit protection, such as the Truth in Lending, Equal Credit Opportunity, and Home Mortgage Disclosure Acts. Many of these consumer protection regulations apply to various lenders outside the banking industry as well as to banks. Members of the Board of Governors are in continual contact with other policy makers in government. They frequently testify before congressional committees on the economy, monetary policy, banking supervision and regulation, consumer credit protection, financial markets, and other matters. The Board has regular contact with members of the President's Council of Economic Advisers and other key economic officials. The Chair also meets from time to time with the President of the United States and has regular meetings with the Secretary of the Treasury. The Chair has formal responsibilities in the international arena as well. In the Depository Institutions Deregulation and Monetary Control Act of 1980, Congress reaffirmed that the Federal Reserve should promote an efficient nationwide payments system. The act subjects all depository institutions, not just member commercial banks, to reserve requirements and grants them equal access to Reserve Bank payment services. The Federal Reserve plays a role in the nation's retail and wholesale payments systems by providing financial services to depository institutions. Retail payments are generally for relatively small-dollar amounts and often involve a depository institution's retail clients‍—‌individuals and smaller businesses. The Reserve Banks' retail services include distributing currency and coin, collecting checks, and electronically transferring funds through the automated clearinghouse system. By contrast, wholesale payments are generally for large-dollar amounts and often involve a depository institution's large corporate customers or counterparties, including other financial institutions. The Reserve Banks' wholesale services include electronically transferring funds through the Fedwire Funds Service and transferring securities issued by the U.S. government, its agencies, and certain other entities through the Fedwire Securities Service. The Federal Reserve System has a "unique structure that is both public and private" and is described as "independent within the government" rather than "independent of government". The System does not require public funding, and derives its authority and purpose from the Federal Reserve Act, which was passed by Congress in 1913 and is subject to Congressional modification or repeal. The four main components of the Federal Reserve System are (1) the board of governors, (2) the Federal Open Market Committee, (3) the twelve regional Federal Reserve Banks, and (4) the member banks throughout the country. The seven-member board of governors is a federal agency. It is charged with the overseeing of the 12 District Reserve Banks and setting national monetary policy. It also supervises and regulates the U.S. banking system in general. Governors are appointed by the President of the United States and confirmed by the Senate for staggered 14-year terms. One term begins every two years, on February 1 of even-numbered years, and members serving a full term cannot be renominated for a second term. "[U]pon the expiration of their terms of office, members of the Board shall continue to serve until their successors are appointed and have qualified." The law provides for the removal of a member of the board by the president "for cause". The board is required to make an annual report of operations to the Speaker of the U.S. House of Representatives. In late December 2011, President Barack Obama nominated Jeremy C. Stein, a Harvard University finance professor and a Democrat, and Jerome Powell, formerly of Dillon Read, Bankers Trust and The Carlyle Group and a Republican. Both candidates also have Treasury Department experience in the Obama and George H. W. Bush administrations respectively. "Obama administration officials [had] regrouped to identify Fed candidates after Peter Diamond, a Nobel Prize-winning economist, withdrew his nomination to the board in June  in the face of Republican opposition. Richard Clarida, a potential nominee who was a Treasury official under George W. Bush, pulled out of consideration in August ", one account of the December nominations noted. The two other Obama nominees in 2011, Janet Yellen and Sarah Bloom Raskin, were confirmed in September. One of the vacancies was created in 2011 with the resignation of Kevin Warsh, who took office in 2006 to fill the unexpired term ending January 31, 2018, and resigned his position effective March 31, 2011. In March 2012, U.S. Senator David Vitter (R, LA) said he would oppose Obama's Stein and Powell nominations, dampening near-term hopes for approval. However, Senate leaders reached a deal, paving the way for affirmative votes on the two nominees in May 2012 and bringing the board to full strength for the first time since 2006 with Duke's service after term end. Later, on January 6, 2014, the United States Senate confirmed Yellen's nomination to be chair of the Federal Reserve Board of Governors; she is slated to be the first woman to hold the position and will become chair on February 1, 2014. Subsequently, President Obama nominated Stanley Fischer to replace Yellen as the Vice Chair. In April 2014, Stein announced he was leaving to return to Harvard May 28 with four years remaining on his term. At the time of the announcement, the FOMC "already is down three members as it awaits the Senate confirmation of ... Fischer and Lael Brainard, and as [President] Obama has yet to name a replacement for ... Duke. ... Powell is still serving as he awaits his confirmation for a second term." Allan R. Landon, former president and CEO of the Bank of Hawaii, was nominated in early 2015 by President Obama to the board. In July 2015, President Obama nominated University of Michigan economist Kathryn M. Dominguez to fill the second vacancy on the board. The Senate had not yet acted on Landon's confirmation by the time of the second nomination. Daniel Tarullo submitted his resignation from the board on February 10, 2017, effective on or around April 5, 2017. The Federal Open Market Committee (FOMC) consists of 12 members, seven from the board of governors and 5 of the regional Federal Reserve Bank presidents. The FOMC oversees and sets policy on open market operations, the principal tool of national monetary policy. These operations affect the amount of Federal Reserve balances available to depository institutions, thereby influencing overall monetary and credit conditions. The FOMC also directs operations undertaken by the Federal Reserve in foreign exchange markets. The FOMC must reach consensus on all decisions. The president of the Federal Reserve Bank of New York is a permanent member of the FOMC; the presidents of the other banks rotate membership at two- and three-year intervals. All Regional Reserve Bank presidents contribute to the committee's assessment of the economy and of policy options, but only the five presidents who are then members of the FOMC vote on policy decisions. The FOMC determines its own internal organization and, by tradition, elects the chair of the board of governors as its chair and the president of the Federal Reserve Bank of New York as its vice chair. Formal meetings typically are held eight times each year in Washington, D.C. Nonvoting Reserve Bank presidents also participate in Committee deliberations and discussion. The FOMC generally meets eight times a year in telephone consultations and other meetings are held when needed. There are 12 Federal Reserve Banks, each of which is responsible for member banks located in its district. They are located in Boston, New York, Philadelphia, Cleveland, Richmond, Atlanta, Chicago, St. Louis, Minneapolis, Kansas City, Dallas, and San Francisco. The size of each district was set based upon the population distribution of the United States when the Federal Reserve Act was passed. The Federal Reserve Banks have an intermediate legal status, with some features of private corporations and some features of public federal agencies. The United States has an interest in the Federal Reserve Banks as tax-exempt federally created instrumentalities whose profits belong to the federal government, but this interest is not proprietary. In Lewis v. United States, the United States Court of Appeals for the Ninth Circuit stated that: "The Reserve Banks are not federal instrumentalities for purposes of the FTCA [the Federal Tort Claims Act], but are independent, privately owned and locally controlled corporations." The opinion went on to say, however, that: "The Reserve Banks have properly been held to be federal instrumentalities for some purposes." Another relevant decision is Scott v. Federal Reserve Bank of Kansas City, in which the distinction is made between Federal Reserve Banks, which are federally created instrumentalities, and the board of governors, which is a federal agency. The amount of stock a member bank must own is equal to 3% of its combined capital and surplus. However, holding stock in a Federal Reserve bank is not like owning stock in a publicly traded company. These stocks cannot be sold or traded, and member banks do not control the Federal Reserve Bank as a result of owning this stock. From the profits of the Regional Bank of which it is a member, a member bank receives a dividend equal to 6% of its purchased stock. The remainder of the regional Federal Reserve Banks' profits is given over to the United States Treasury Department. In 2015, the Federal Reserve Banks made a profit of $100.2 billion and distributed $2.5 billion in dividends to member banks as well as returning $97.7 billion to the U.S. Treasury. The annual and quarterly financial statements prepared by the Federal Reserve System conform to a basis of accounting that is set by the Federal Reserve Board and does not conform to Generally Accepted Accounting Principles (GAAP) or government Cost Accounting Standards (CAS). The financial reporting standards are defined in the Financial Accounting Manual for the Federal Reserve Banks. The cost accounting standards are defined in the Planning and Control System Manual. As of 27 August 2012[update], the Federal Reserve Board has been publishing unaudited financial reports for the Federal Reserve banks every quarter. November 7, 2008, Bloomberg L.P. News brought a lawsuit against the board of governors of the Federal Reserve System to force the board to reveal the identities of firms for which it has provided guarantees during the financial crisis of 2007–2008. Bloomberg, L.P. won at the trial court and the Fed's appeals were rejected at both the United States Court of Appeals for the Second Circuit and the U.S. Supreme Court. The data was released on March 31, 2011. The term "monetary policy" refers to the actions undertaken by a central bank, such as the Federal Reserve, to influence the availability and cost of money and credit to help promote national economic goals. What happens to money and credit affects interest rates (the cost of credit) and the performance of an economy. The Federal Reserve Act of 1913 gave the Federal Reserve authority to set monetary policy in the United States. The Federal Reserve implements U.S. monetary policy by affecting conditions in the market for balances that depository institutions hold at the Federal Reserve Banks...By conducting open market operations, imposing reserve requirements, permitting depository institutions to hold contractual clearing balances, and extending credit through its discount window facility, the Federal Reserve exercises considerable control over the demand for and supply of Federal Reserve balances and the federal funds rate. Through its control of the federal funds rate, the Federal Reserve is able to foster financial and monetary conditions consistent with its monetary policy objectives. Open market operations Purchases and sales of U.S. Treasury and federal agency securities‍—‌the Federal Reserve's principal tool for implementing monetary policy. The Federal Reserve's objective for open market operations has varied over the years. During the 1980s, the focus gradually shifted toward attaining a specified level of the federal funds rate (the rate that banks charge each other for overnight loans of federal funds, which are the reserves held by banks at the Fed), a process that was largely complete by the end of the decade. Discount rate The interest rate charged to commercial banks and other depository institutions on loans they receive from their regional Federal Reserve Bank's lending facility‍—‌the discount window. Reserve requirements The amount of funds that a depository institution must hold in reserve against specified deposit liabilities. The Federal Reserve System implements monetary policy largely by targeting the federal funds rate. This is the interest rate that banks charge each other for overnight loans of federal funds, which are the reserves held by banks at the Fed. This rate is actually determined by the market and is not explicitly mandated by the Fed. The Fed therefore tries to align the effective federal funds rate with the targeted rate by adding or subtracting from the money supply through open market operations. The Federal Reserve System usually adjusts the federal funds rate target by 0.25% or 0.50% at a time. Open market operations allow the Federal Reserve to increase or decrease the amount of money in the banking system as necessary to balance the Federal Reserve's dual mandates. Open market operations are done through the sale and purchase of United States Treasury security, sometimes called "Treasury bills" or more informally "T-bills" or "Treasuries". The Federal Reserve buys Treasury bills from its primary dealers. The purchase of these securities affects the federal funds rate, because primary dealers have accounts at depository institutions. To smooth temporary or cyclical changes in the money supply, the desk engages in repurchase agreements (repos) with its primary dealers. Repos are essentially secured, short-term lending by the Fed. On the day of the transaction, the Fed deposits money in a primary dealer's reserve account, and receives the promised securities as collateral. When the transaction matures, the process unwinds: the Fed returns the collateral and charges the primary dealer's reserve account for the principal and accrued interest. The term of the repo (the time between settlement and maturity) can vary from 1 day (called an overnight repo) to 65 days. The Federal Reserve System also directly sets the "discount rate", which is the interest rate for "discount window lending", overnight loans that member banks borrow directly from the Fed. This rate is generally set at a rate close to 100 basis points above the target federal funds rate. The idea is to encourage banks to seek alternative funding before using the "discount rate" option. The equivalent operation by the European Central Bank is referred to as the "marginal lending facility". Both the discount rate and the federal funds rate influence the prime rate, which is usually about 3 percentage points higher than the federal funds rate. Another instrument of monetary policy adjustment employed by the Federal Reserve System is the fractional reserve requirement, also known as the required reserve ratio. The required reserve ratio sets the balance that the Federal Reserve System requires a depository institution to hold in the Federal Reserve Banks, which depository institutions trade in the federal funds market discussed above. The required reserve ratio is set by the board of governors of the Federal Reserve System. The reserve requirements have changed over time and some history of these changes is published by the Federal Reserve. The Term Securities Lending Facility is a 28-day facility that will offer Treasury general collateral to the Federal Reserve Bank of New York's primary dealers in exchange for other program-eligible collateral. It is intended to promote liquidity in the financing markets for Treasury and other collateral and thus to foster the functioning of financial markets more generally. Like the Term Auction Facility, the TSLF was done in conjunction with the Bank of Canada, the Bank of England, the European Central Bank, and the Swiss National Bank. The resource allows dealers to switch debt that is less liquid for U.S. government securities that are easily tradable. The currency swap lines with the European Central Bank and Swiss National Bank were increased. The Primary Dealer Credit Facility (PDCF) is an overnight loan facility that will provide funding to primary dealers in exchange for a specified range of eligible collateral and is intended to foster the functioning of financial markets more generally. This new facility marks a fundamental change in Federal Reserve policy because now primary dealers can borrow directly from the Fed when this used to be prohibited. As of October 2008[update], the Federal Reserve banks will pay interest on reserve balances (required and excess) held by depository institutions. The rate is set at the lowest federal funds rate during the reserve maintenance period of an institution, less 75bp. As of 23 October 2008[update], the Fed has lowered the spread to a mere 35 bp. On October 7, 2008, the Federal Reserve further expanded the collateral it will loan against to include commercial paper using the new Commercial Paper Funding Facility (CPFF). The action made the Fed a crucial source of credit for non-financial businesses in addition to commercial banks and investment firms. Fed officials said they'll buy as much of the debt as necessary to get the market functioning again. They refused to say how much that might be, but they noted that around $1.3 trillion worth of commercial paper would qualify. There was $1.61 trillion in outstanding commercial paper, seasonally adjusted, on the market as of 1 October 2008[update], according to the most recent data from the Fed. That was down from $1.70 trillion in the previous week. Since the summer of 2007, the market has shrunk from more than $2.2 trillion. This program lent out a total $738 billion before it was closed. Forty-five out of 81 of the companies participating in this program were foreign firms. Research shows that Troubled Asset Relief Program (TARP) recipients were twice as likely to participate in the program than other commercial paper issuers who did not take advantage of the TARP bailout. The Fed incurred no losses from the CPFF. A little-used tool of the Federal Reserve is the quantitative policy. With that the Federal Reserve actually buys back corporate bonds and mortgage backed securities held by banks or other financial institutions. This in effect puts money back into the financial institutions and allows them to make loans and conduct normal business. The bursting of the United States housing bubble prompted the Fed to buy mortgage-backed securities for the first time in November 2008. Over six weeks, a total of $1.25 trillion were purchased in order to stabilize the housing market, about one-fifth of all U.S. government-backed mortgages. The first attempt at a national currency was during the American Revolutionary War. In 1775, the Continental Congress, as well as the states, began issuing paper currency, calling the bills "Continentals". The Continentals were backed only by future tax revenue, and were used to help finance the Revolutionary War. Overprinting, as well as British counterfeiting, caused the value of the Continental to diminish quickly. This experience with paper money led the United States to strip the power to issue Bills of Credit (paper money) from a draft of the new Constitution on August 16, 1787, as well as banning such issuance by the various states, and limiting the states' ability to make anything but gold or silver coin legal tender on August 28. In 1791, the government granted the First Bank of the United States a charter to operate as the U.S. central bank until 1811. The First Bank of the United States came to an end under President Madison because Congress refused to renew its charter. The Second Bank of the United States was established in 1816, and lost its authority to be the central bank of the U.S. twenty years later under President Jackson when its charter expired. Both banks were based upon the Bank of England. Ultimately, a third national bank, known as the Federal Reserve, was established in 1913 and still exists to this day. The first U.S. institution with central banking responsibilities was the First Bank of the United States, chartered by Congress and signed into law by President George Washington on February 25, 1791, at the urging of Alexander Hamilton. This was done despite strong opposition from Thomas Jefferson and James Madison, among numerous others. The charter was for twenty years and expired in 1811 under President Madison, because Congress refused to renew it. The main motivation for the third central banking system came from the Panic of 1907, which caused a renewed desire among legislators, economists, and bankers for an overhaul of the monetary system. During the last quarter of the 19th century and the beginning of the 20th century, the United States economy went through a series of financial panics. According to many economists, the previous national banking system had two main weaknesses: an inelastic currency and a lack of liquidity. In 1908, Congress enacted the Aldrich–Vreeland Act, which provided for an emergency currency and established the National Monetary Commission to study banking and currency reform. The National Monetary Commission returned with recommendations which were repeatedly rejected by Congress. A revision crafted during a secret meeting on Jekyll Island by Senator Aldrich and representatives of the nation's top finance and industrial groups later became the basis of the Federal Reserve Act. The House voted on December 22, 1913, with 298 voting yes to 60 voting no. The Senate voted 43–25 on December 23, 1913. President Woodrow Wilson signed the bill later that day. The head of the bipartisan National Monetary Commission was financial expert and Senate Republican leader Nelson Aldrich. Aldrich set up two commissions – one to study the American monetary system in depth and the other, headed by Aldrich himself, to study the European central banking systems and report on them. In early November 1910, Aldrich met with five well known members of the New York banking community to devise a central banking bill. Paul Warburg, an attendee of the meeting and longtime advocate of central banking in the U.S., later wrote that Aldrich was "bewildered at all that he had absorbed abroad and he was faced with the difficult task of writing a highly technical bill while being harassed by the daily grind of his parliamentary duties". After ten days of deliberation, the bill, which would later be referred to as the "Aldrich Plan", was agreed upon. It had several key components, including a central bank with a Washington-based headquarters and fifteen branches located throughout the U.S. in geographically strategic locations, and a uniform elastic currency based on gold and commercial paper. Aldrich believed a central banking system with no political involvement was best, but was convinced by Warburg that a plan with no public control was not politically feasible. The compromise involved representation of the public sector on the Board of Directors. Aldrich's bill met much opposition from politicians. Critics charged Aldrich of being biased due to his close ties to wealthy bankers such as J. P. Morgan and John D. Rockefeller, Jr., Aldrich's son-in-law. Most Republicans favored the Aldrich Plan, but it lacked enough support in Congress to pass because rural and western states viewed it as favoring the "eastern establishment". In contrast, progressive Democrats favored a reserve system owned and operated by the government; they believed that public ownership of the central bank would end Wall Street's control of the American currency supply. Conservative Democrats fought for a privately owned, yet decentralized, reserve system, which would still be free of Wall Street's control. The original Aldrich Plan was dealt a fatal blow in 1912, when Democrats won the White House and Congress. Nonetheless, President Woodrow Wilson believed that the Aldrich plan would suffice with a few modifications. The plan became the basis for the Federal Reserve Act, which was proposed by Senator Robert Owen in May 1913. The primary difference between the two bills was the transfer of control of the Board of Directors (called the Federal Open Market Committee in the Federal Reserve Act) to the government. The bill passed Congress on December 23, 1913, on a mostly partisan basis, with most Democrats voting "yea" and most Republicans voting "nay". The Federal Reserve records and publishes large amounts of data. A few websites where data is published are at the board of governors' Economic Data and Research page, the board of governors' statistical releases and historical data page, and at the St. Louis Fed's FRED (Federal Reserve Economic Data) page. The Federal Open Market Committee (FOMC) examines many economic indicators prior to determining monetary policy. Some criticism involves economic data compiled by the Fed. The Fed sponsors much of the monetary economics research in the U.S., and Lawrence H. White objects that this makes it less likely for researchers to publish findings challenging the status quo. M1 M0 + those portions of M0 held as reserves or vault cash + the amount in demand accounts ("checking" or "current" accounts). M2 M1 + most savings accounts, money market accounts, and small denomination time deposits (certificates of deposit of under $100,000). M3 M2 + all other CDs, deposits of eurodollars and repurchase agreements. The Personal consumption expenditures price index, also referred to as simply the PCE price index, is used as one measure of the value of money. It is a United States-wide indicator of the average increase in prices for all domestic personal consumption. Using a variety of data including United States Consumer Price Index and U.S. Producer Price Index prices, it is derived from the largest component of the gross domestic product in the BEA's National Income and Product Accounts, personal consumption expenditures. One of the Fed's main roles is to maintain price stability, which means that the Fed's ability to keep a low inflation rate is a long-term measure of their success. Although the Fed is not required to maintain inflation within a specific range, their long run target for the growth of the PCE price index is between 1.5 and 2 percent. There has been debate among policy makers as to whether the Federal Reserve should have a specific inflation targeting policy. Most mainstream economists favor a low, steady rate of inflation. Low (as opposed to zero or negative) inflation may reduce the severity of economic recessions by enabling the labor market to adjust more quickly in a downturn, and reduce the risk that a liquidity trap prevents monetary policy from stabilizing the economy. The task of keeping the rate of inflation low and stable is usually given to monetary authorities. One of the stated goals of monetary policy is maximum employment. The unemployment rate statistics are collected by the Bureau of Labor Statistics, and like the PCE price index are used as a barometer of the nation's economic health. One of the keys to understanding the Federal Reserve is the Federal Reserve balance sheet (or balance statement). In accordance with Section 11 of the Federal Reserve Act, the board of governors of the Federal Reserve System publishes once each week the "Consolidated Statement of Condition of All Federal Reserve Banks" showing the condition of each Federal Reserve bank and a consolidated statement for all Federal Reserve banks. The board of governors requires that excess earnings of the Reserve Banks be transferred to the Treasury as interest on Federal Reserve notes. Note: The Fed balance sheet shown in this article has assets, liabilities and net equity that do not add to the balance. The Fed balance sheet is missing the item "Reserve Balances with Federal Reserve Banks" which would make the figures balance. In addition, the balance sheet also indicates which assets are held as collateral against Federal Reserve Notes. The Federal Reserve raising the Federal Funds Rate above U.S. Treasury interest rates creates an inverted yield curve causing recessions. The Federal Reserve System has faced various criticisms since its inception in 1913. Critique of the organization and system has come from sources such as writers, journalists, economists, and financial institutions as well as politicians and various government employees. Criticisms include transparency, doubt of efficacy due to what is seen by some as poor historical performance and traditionalist concerns about the debasement of the value of the dollar. From the beginning, the Federal Reserve has been the subject of many popular conspiracy theories, that typically link the Fed to numerous other supposed conspiracies. ^ "The Federal Reserve Bank Discount Window & Payment System Risk Website". Federal Reserve System. Retrieved September 27, 2018. ^ "Open Market Operations Archive". Federal Reserve System. Retrieved September 27, 2018. ^ "Interest on Required Reserve Balances and Excess Balances". Federal Reserve System. Retrieved September 27, 2018. ^ a b c BoG 2006, pp. 1 "Just before the founding of the Federal Reserve, the nation was plagued with financial crises. At times, these crises led to 'panics,' in which people raced to their banks to withdraw their deposits. A particularly severe panic in 1907 resulted in bank runs that wreaked havoc on the fragile banking system and ultimately led Congress in 1913 to write the Federal Reserve Act. Initially created to address these banking panics, the Federal Reserve is now charged with a number of broader responsibilities, including fostering a sound banking system and a healthy economy." ^ a b c "Panic of 1907: J.P. Morgan Saves the Day". US-history.com. Retrieved December 6, 2014. ^ a b c "Born of a Panic: Forming the Fed System". The Federal Reserve Bank of Minneapolis. Retrieved December 6, 2014. ^ a b c Abigail Tucker (October 29, 2008). "The Financial Panic of 1907: Running from History". Smithsonian Magazine. Retrieved December 6, 2014. ^ BoG 2005, pp. 1 "It was founded by Congress in 1913 to provide the nation with a safer, more flexible, and more stable monetary and financial system. Over the years, its role in banking and the economy has expanded." ^ "The Congress established two key objectives for monetary policy-maximum employment and stable prices-in the Federal Reserve Act. These objectives are sometimes referred to as the Federal Reserve's dual mandate". Federalreserve.gov. January 25, 2012. Retrieved April 30, 2012. ^ a b "FRB: Mission". Federalreserve.gov. November 6, 2009. Retrieved October 29, 2011. ^ "Federal Reserve Districts". Federal Reserve Online. n.d. Retrieved August 29, 2011. ^ a b "FAQ – Who owns the Federal Reserve?". Federal Reserve website. Retrieved December 1, 2015. ^ Lapidos, Juliet (September 19, 2008). "Is the Fed Private or Public?". Slate. Retrieved August 29, 2011. ^ "Who owns the Federal Reserve Bank?". FactCheck. March 31, 2008. Retrieved February 26, 2014. ^ "Coins and Currency". US Dept of Treasury website. August 24, 2011. Archived from the original on December 3, 2010. Retrieved August 29, 2011. ^ a b "Press Release – Federal Reserve Board announces Reserve Bank income and expense data and transfers to the Treasury for 2015". Board of Governors of the Federal Reserve System. January 11, 2016. Retrieved March 12, 2016. ^ "Federal Reserve Act". Board of Governors of the Federal Reserve System. May 14, 2003. Archived from the original on May 17, 2008. ^ Bernanke, Ben (October 24, 2003). "Remarks by Governor Ben S. Bernanke: At the Federal Reserve Bank of Dallas Conference on the Legacy of Milton and Rose Friedman's Free to Choose, Dallas, Texas" (text). ^ Milton Friedman; Anna Jacobson Schwartz (2008). "B. Bernanke's speech to M. Friedman". The Great Contraction, 1929–1933 (New Edition). Princeton University Press. p. 247. ISBN 0-691-13794-3. ^ Humphrey, Thomas M. (January 1, 1989). "Lender of Last Resort: The Concept in History". Social Science Research Network. SSRN 2125371. ^ "Press Release: Federal Reserve Board, with full support of the Treasury Department, authorizes the Federal Reserve Bank of New York to lend up to $85 billion to the American International Group (AIG)". Board of Governors of the Federal Reserve. September 16, 2008. Retrieved August 29, 2011. ^ Andrews, Edmund L.; de la Merced, Michael J.; Walsh, Mary Williams (September 16, 2008). "Fed's $85 Billion Loan Rescues Insurer". The New York Times. Retrieved September 17, 2008. ^ "How Currency Gets into Circulation". Federal Reserve Bank of New York. June 2008. Retrieved August 29, 2011. ^ "Chief Financial Officer Performance and Accountability Report" (PDF). Bureau of Engraving and Printing. p. 25. Retrieved August 9, 2015. ^ "Federal Funds". Federal Reserve Bank of New York. August 2007. Retrieved August 29, 2011. ^ Cook, Timothy Q.; Laroche, Robert K., eds. (1993). "Instruments of the Money Market" (PDF). Federal Reserve Bank of Richmond. Retrieved August 29, 2011. ^ "Speech – Kohn, The Evolving Role of the Federal Reserve Banks". Federalreserve.gov. November 3, 2006. Retrieved August 29, 2011. ^ "Federal Reserve System Current and Future Challenges Require System-wide Attention: Statement of Charles A. Bowsher" (PDF). United States General Accounting Office. July 26, 1996. Retrieved August 29, 2011. ^ See example: "Advantages of Being/Becoming a State Chartered Bank". Arkansas State Bank Department. March 31, 2009. Retrieved August 29, 2011. ^ "U.S. Code Title 12, Chapter 3, Subchapter 7, Section 301. Powers and duties of board of directors; suspension of member bank for undue use of bank credit". Law.cornell.edu. June 22, 2010. Retrieved August 29, 2011. ^ "Is The Fed Public Or Private?" Federal Reserve Bank of Philadelphia. Retrieved June 29, 2012. ^ 12 U.S.C. § 247. ^ a b "FRB: Board Members". Federalreserve.gov. July 20, 2011. Retrieved August 29, 2011. ^ See 12 U.S.C. § 242. ^ a b Goldstein, Steve (December 27, 2011). "Obama to nominate Stein, Powell to Fed board". MarketWatch. Retrieved December 27, 2011. ^ "Jerome Powell: Visiting Scholar" Archived December 21, 2011, at the Wayback Machine https://web.archive.org/web/20151015224732/http://bipartisanpolicy.org/about/economic-policy-project/jerome-powell. Bipartisan Policy Center. Retrieved December 27, 2011. ^ Lanman, Scott; Runningen, Roger (December 27, 2011). "Obama to Choose Powell, Stein for Fed Board". Bloomberg LP. Retrieved December 27, 2011. ^ Robb, Greg (April 29, 2010). "Obama nominates 3 to Federal Reserve board". MarketWatch. Retrieved April 29, 2010. ^ Lanman, Scott (September 30, 2010). "Yellen, Raskin Win Senate Approval for Fed Board of Governors". Bloomberg LP. Retrieved December 27, 2011. ^ Censky, Annalyn (February 10, 2011). "Fed inflation hawk Warsh resigns". CNNMoney. Retrieved December 27, 2011. ^ Chan, Sewell (February 10, 2011). "Sole Fed Governor With Close Ties to Conservatives Resigns". The New York Times. Retrieved December 27, 2011. ^ Robb, Greg (March 28, 2012). "Senator to block quick vote on Fed picks: report". MarketWatch. Retrieved March 28, 2012. ^ Robb, Greg, "Stein sworn in as Fed governor", MarketWatch, May 30, 2012. Retrieved May 30, 2012. ^ Lowrey, Annie (January 6, 2014). "Senate Confirms Yellen as Fed Chairwoman". The New York Times. Retrieved January 6, 2014. ^ "Fischer to Serve as Vice Chairman of the Federal Reserve". Israel National News. Retrieved January 11, 2014. ^ Goldstein, Steve, "Jeremy Stein to resign from Federal Reserve", MarketWatch, April 3, 2014. Retrieved April 3, 2014. ^ Appelbaum, Binyamin, "Allan Landon, Community Banker, Nominated to Federal Reserve", The New York Times, January 6, 2015. Retrieved January 6, 2015. ^ Leubsdorf, Ben, "Kathryn Dominguez to Be Nominated for Fed Governor", Wall Street Journal, July 20, 2015. Retrieved July 20, 2015. ^ "Press Release, Board of Governors of the Federal Reserve System". Federal Reserve. February 10, 2017. Retrieved March 27, 2017. ^ Woodward, G. Thomas (July 31, 1996). "Money and the Federal Reserve System: Myth and Reality – CRS Report for Congress, No. 96-672 E". Congressional Research Service Library of Congress. Retrieved November 23, 2008. ^ "Federal Reserve Bank Presidents". Federalreserve.gov. July 20, 2011. Retrieved August 29, 2011. ^ "US Code: Title 12, Subchapter VII – Directors of Federal Reserve Banks; Reserve Agents and Assistants". Law.cornell.edu. June 22, 2010. Retrieved August 29, 2011. ^ a b Kennedy C. Scott v. Federal Reserve Bank of Kansas City, et al. Archived June 14, 2007, at the Wayback Machine, 406 F.3d 532 Archived May 17, 2010, at the Wayback Machine (8th Cir. 2005). ^ 680 F.2d 1239 Archived May 15, 2010, at the Wayback Machine (9th Cir. 1982). ^ "Section 2.3 Subscription to Stock by National Banks". Federal Reserve Act. Board of Governors of the Federal Reserve System. December 14, 2010. Retrieved February 6, 2011. ^ "Section 5.1 Amount of Shares; Increase and Decrease of Capital; Surrender and Cancellation of Stock". Federal Reserve Act. Board of Governors of the Federal Reserve System. December 14, 2010. Retrieved February 6, 2011. ^ "Federal Reserve Membership". Federal Reserve Bank of Richmond. Retrieved April 30, 2012. ^ Reddy, Sudeep (August 31, 2009). "What would a federal reserve audit show". The Wall Street Journal. Retrieved August 29, 2011. ^ a b "Financial Accounting Manual for Federal Reserve Banks, January 2018". Retrieved September 19, 2018. ^ "Federal Reserve Board begins practice of publishing Reserve Bank financial reports on a quarterly basis". Federal Reserve Bank. August 27, 2012. Retrieved November 24, 2012. ^ Ryan Chittum (August 25, 2009). "Bloomberg Wins Its Lawsuit Against the Federal Reserve". Columbia Journalism Review. Retrieved November 24, 2012. ^ Torres, Craig (March 31, 2011). "Fed Releases Discount-Window Loan Records Under Court Order". Businessweek. Retrieved December 20, 2012. ^ a b "Federal Open Market Committee". Federalreserve.gov. August 22, 2011. Retrieved August 29, 2011. ^ "Federal Reserve System in Action". Federal Reserve Bank of Richmond. 2012. Archived from the original on October 19, 2012. Retrieved November 24, 2012. ^ "Monetary Policy, Open Market Operations". Federalreserve.gov. January 26, 2010. Archived from the original on April 13, 2001. Retrieved August 29, 2011. ^ "FRB: Monetary Policy, the Discount Rate". Federalreserve.gov. July 19, 2011. Retrieved August 29, 2011. ^ a b "Monetary Policy, Reserve Requirements". Federalreserve.gov. October 26, 2010. Retrieved August 29, 2011. ^ "Open Market Operations". New York Federal Reserve Bank. August 2007. Retrieved October 29, 2011. ^ "Repurchase and Reverse Repurchase Transactions". Ny.frb.org. Federal Reserve Bank of New York. August 2007. Retrieved August 29, 2011. ^ Feinman, Joshua N. (June 1993). "Reserve Requirements: History, Current Practice, and Potential Reform" (PDF). Federal Reserve Bulletin: 569–589. Retrieved August 29, 2011. ^ "Board announces that it will begin to pay interest on depository institutions required and excess reserve balances". Federal Reserve. October 6, 2008. Retrieved August 29, 2011. ^ a b c "FRB: Temporary Auction Facility FAQ". Federalreserve.gov. January 12, 2009. Retrieved August 29, 2011. ^ "Federal Reserve intends to continue term TAF auctions as necessary". Federalreserve.gov. December 21, 2007. Retrieved August 29, 2011. ^ "Announcement of the creation of the Term Securities Lending Facility". Federal Reserve. March 11, 2008. Retrieved August 29, 2011. ^ "Fed Seeks to Limit Slump by Taking Mortgage Debt". bloomberg.com. March 12, 2008. "The step goes beyond past initiatives because the Fed can now inject liquidity without flooding the banking system with cash...Unlike the newest tool, the past steps added cash to the banking system, which affects the Fed's benchmark interest rate...By contrast, the TSLF injects liquidity by lending Treasuries, which doesn't affect the federal funds rate. That leaves the Fed free to address the mortgage crisis directly without concern about adding more cash to the system than it wants"
^ "Federal Reserve Announces Establishment of Primary Dealer Credit Facility – Federal Reserve Bank of New York". Newyorkfed.org. March 16, 2008. Retrieved August 29, 2011. ^ Lanman, Scott (March 20, 2008). "Fed Says Securities Firms Borrow $28.8 Bln With New Financing". Bloomberg.com. Retrieved August 29, 2011. ^ a b "Primary Dealer Credit Facility: Frequently Asked Questions – Federal Reserve Bank of New York". Newyorkfed.org. February 3, 2009. Retrieved August 29, 2011. ^ "Fed Announces Emergency Steps to Ease Credit Crisis – Economy". Cnbc.com. Reuters. March 17, 2008. Retrieved August 29, 2011. ^ "Examining the Federal Reserve's New Liquidity Measures". Frbatlanta.org. April 15, 2008. Archived from the original on October 7, 2013. Retrieved August 29, 2011. ^ "Reserve Requirements of Depository Institutions Policy on Payment System Risk," 75 Federal Register 86 (May 5, 2010), pp. 24384–24389. ^ "Announcement of the creation of the Term Auction Facility – FRB: Press Release – Federal Reserve and other central banks announce measures designed to address elevated pressures in short-term funding markets". federalreserve.gov. December 12, 2007. ^ "A dirty job, but someone has to do it". economist.com. December 13, 2007. Retrieved August 29, 2011. The Fed's discount window, for instance, through which it lends direct to banks, has barely been approached, despite the soaring spreads in the interbank market. The quarter-point cuts in its federal funds rate and discount rate on December 11 were followed by a steep sell-off in the stockmarket...The hope is that by extending the maturity of central-bank money, broadening the range of collateral against which banks can borrow and shifting from direct lending to an auction, the central bankers will bring down spreads in the one- and three-month money markets. There will be no net addition of liquidity. What the central bankers add at longer-term maturities, they will take out in the overnight market. But there are risks. The first is that, for all the fanfare, the central banks' plan will make little difference. After all, it does nothing to remove the fundamental reason why investors are worried about lending to banks. This is the uncertainty about potential losses from subprime mortgages and the products based on them, and – given that uncertainty – the banks' own desire to hoard capital against the chance that they will have to strengthen their balance sheets. ^ "Unclogging the system". economist.com. December 13, 2007. Retrieved August 29, 2011. ^ a b Robb, Greg (December 12, 2007). "Fed, top central banks to flood markets with cash". Marketwatch.com. Retrieved August 29, 2011. ^ "Term Securities Lending Facility: Frequently Asked Questions". Newyorkfed.org. Retrieved December 6, 2014. ^ "Interest on Required Reserve Balances and Excess Balances". Federal Reserve Board. October 6, 2008. Retrieved October 14, 2008. ^ "Press Release". Federal Reserve Board. October 22, 2008. Retrieved October 22, 2008. ^ "Federal Reserve Board approves amendments to Regulation D authorizing Reserve Banks to offer term deposits". Federalreserve.gov. April 30, 2010. Retrieved August 29, 2011. ^ "Board authorizes small-value offerings of term deposits under the Term Deposit Facility". Federalreserve.gov. May 10, 2010. Retrieved August 29, 2011. ^ "Board authorizes ongoing small-value offerings of term deposits under the Term Deposit Facility". Federalreserve.gov. September 8, 2010. Retrieved August 29, 2011. ^ Zumbrun, Joshua (September 8, 2010). "Fed to Sell Term Deposits to Ensure Exit 'Readiness'". Bloomberg. Retrieved September 10, 2010. ^ "Asset-Backed Commercial Paper Money Market Mutual Fund Liquidity Facility". Board of Governors of the Federal Reserve System. Retrieved May 27, 2010. ^ "Federal Reserve Mortgage Purchase Program: Planet Money". NPR. August 26, 2010. Retrieved August 29, 2011. ^ Chairman Alan Greenspan (May 2, 1998). "Our banking history". ^ "History of the Federal Reserve". Federal reserve education.org. "Chapter 1. Early Experiments in Central Banking". Historical Beginnings... The Federal Reserve (PDF). 1999. 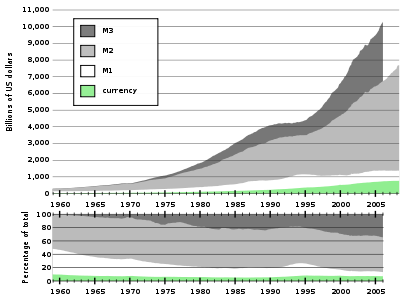 ^ "Timeline of U.S. Currency History". U.S. Currency Education Program. Retrieved June 8, 2016. ^ ""Mr. Govr. MORRIS moved to strike out "and emit bills on the credit of the U. States" – If the United States had credit such bills would be unnecessary: if they had not, unjust & useless. ... On the motion for striking out N. H. ay. Mas. ay. Ct ay. N. J. no. Pa. ay. Del. ay. Md. no. Va. ay. N. C. ay. S. C. ay. Geo. ay."". Avalon.law.yale.edu. Retrieved April 30, 2012. ^ Flamme, Karen. "1995 Annual Report: A Brief History of Our Nation's Paper Money". Federal Reserve Bank of San Francisco. Retrieved August 26, 2010. ^ a b c Johnson, Roger (December 1999). "Historical Beginnings... The Federal Reserve" (PDF). Federal Reserve Bank of Boston. p. 8. Retrieved July 23, 2010. ^ a b Flaherty, Edward (June 16, 1997). "A Brief History of Central Banking in the United States". Netherlands: University of Groningen. ^ a b Whithouse, Michael (May 1989). "Paul Warburg's Crusade to Establish a Central Bank in the United States". The Federal Reserve Bank of Minneapolis. Archived from the original on May 16, 2008. Retrieved August 29, 2011. ^ "For years members of the Jekyll Island Club would recount the story of the secret meeting and by the 1930s the narrative was considered a club tradition". Jekyllislandhistory.com. Retrieved April 30, 2012. ^ "Papers of Frank A.Vanderlip "I wish I could sit down with you and half a dozen others in the sort of conference that created the Federal Reserve Act"" (PDF). Retrieved April 30, 2012. ^ "The Federal Reserve Act of 1913 – A Legislative History". Llsdc.org. Retrieved April 30, 2012. ^ "Affixes His Signature at 6:02 P.M., Using Four Gold Pens" (PDF). New York Times. December 24, 1913. Retrieved April 30, 2012. ^ a b c "Paul Warburg's Crusade to Establish a Central Bank in the United States". The Federal Reserve Bank of Minneapolis. ^ a b c d "America's Unknown Enemy: Beyond Conspiracy" (PDF). American Institute of Economic Research. ^ "Congressional Record – House". Scribd.com. December 22, 1913. p. 1465. Retrieved August 29, 2011. ^ "Congressional Record – Senate". Scribd.com. December 23, 1913. p. 1468. Retrieved August 29, 2011. ^ "FRB: Economic Research & Data". Federalreserve.gov. August 24, 2011. Retrieved August 29, 2011. ^ "Statistics: Releases and Historical Data". Federalreserve.gov. May 10, 2010. Retrieved August 29, 2011. ^ "St. Louis Fed: Economic Data – FRED". Research.stlouisfed.org. August 20, 2011. Retrieved August 29, 2011. ^ White, Lawrence H. (August 2005). "The Federal Reserve System's Influence on Research in Monetary Economics". Econ Journal Watch. 2 (2): 325–354. Retrieved August 29, 2011. ^ FRB: Z.1 Release – Flow of Funds Accounts of the United States, Release Dates See the pdf documents from 1945 to 2007. The value for each year is on page 94 of each document (the 99th page in a pdf viewer) and duplicated on page 104 (109th page in pdf viewer). It gives the total assets, total liabilities, and net worth. This chart is of the net worth. ^ "Discontinuance of M3". Federalreserve.gov. November 10, 2005. Retrieved August 29, 2011. ^ "Is the Fed's Definition of Price Stability Evolving?" (PDF). Federal Reserve Bank of St. Louis. November 9, 2010. Retrieved February 13, 2011. ^ "Remarks by Governor Ben S. Bernanke – A perspective on inflation targeting". Federalreserve.gov. March 25, 2003. Retrieved August 29, 2011. ^ "What's The Fuss Over Inflation Targeting?". Businessweek.com. November 7, 2005. Archived from the original on July 28, 2011. Retrieved August 29, 2011. ^ "A–Z Listing of Board Publications". Federalreserve.gov. August 10, 2011. Retrieved August 29, 2011. ^ "96th Annual Report 2008 Federal Reserve" (PDF). Board of Governors of the Federal Reserve System. June 2009. Retrieved August 29, 2011. ^ "Factors Affecting Reserve Balances of Depository Institutions and Condition Statement of Federal Reserve Banks". Federal Reserve. Retrieved March 20, 2008. ^ a b "Congressional Record June 10, 1932, Louis T McFadden". June 10, 1932. ^ Johnson, Roger T. (February 2010). "Historical Beginnings... The Federal Reserve" (PDF). Federal Reserve Bank of Boston. Retrieved December 30, 2014. ^ Silver-Greenberg, Jessica; Protess, Ben; Eavis, Peter (November 19, 2014). "Rising Security as Banks Hire from the Fed". The New York Times. Retrieved December 6, 2014. ^ a b Grace Wyler (May 8, 2012). "Ron Paul Is Hosting A Hearing On Ending The Federal Reserve Right Now". Business Insider Inc.
^ Brian Lamb (October 28, 1994). Book Discussion on The Road to Serfdom. C-SPAN. Milton Friedman. National Cable Satellite Corporation. LAMB: What do you think of the Federal Reserve Board today? FRIEDMAN: I've long been in favor of abolishing it. There's no institution in the United States that has such a high public standing and such a poor record of performance. Board of Governors of the Federal Reserve System (2005). The Federal Reserve System: Purposes and Functions (PDF). Archived from the original (PDF) on January 11, 2014. Meyer, Laurence H. (2004). A Term at the Fed: An Insider's View. HarperBusiness. ISBN 0-06-054270-5; focuses on the period from 1996 to 2002, emphasizing Alan Greenspan's chairmanship during the 1997 Asian financial crisis, the stock market boom and the financial aftermath of the September 11, 2001 attacks. Friedman, Milton; Schwartz, Anna Jacobson (1963). A Monetary History of the United States, 1867–1960. Princeton University Press. ISBN 978-0691003542. Link, Arthur (1956). Wilson: The New Freedom. Princeton University Press. pp. 199–240. Lowenstein, Roger (2015). America's Bank: The Epic Struggle to Create the Federal Reserve. Penguin Press. p. 368. ISBN 978-0143109846. Meltzer, Allan H. (2009). A History of the Federal Reserve, Volume 2: Book 1, 1951–1969. ISBN 978-0-226-52001-8. Meltzer, Allan H. (2009). A History of the Federal Reserve, Volume 2: Book 2, 1969–1985. ISBN 978-0-226-51994-4. In three volumes published so far, Meltzer covers the first 70 years of the Fed in considerable detail. Rothbard, Murray (2007). The Case Against the Fed. Ludwig von Mises Institute. ISBN 978-1467934893. Temin, Peter (1976). Did Monetary Forces Cause the Great Depression?. W. W. Norton & Company. ISBN 978-0393092097. Wikisource has the text of the 1922 Encyclopædia Britannica article Federal Reserve Banking System.